Home>News of Containers > Kewazo has developed a smart robotics delivery system. Kewazo has developed a smart robotics delivery system. Scaffolding assembly is inefficient now because 80% of time is dedicated to transportation of scaffolding parts during assembly. Kewazo’s Smart Robotics Delivery System seeks to mitigate this problem by providing an autonomous transportation system of materials on the work site that deliver materials at the right place at the right time. Kewazo has successfully raised over 1 million euros in funding, which they hope will allow the firm to bring its robotics delivery system to the market, and allow the firm to establish a strong sales network. Kewazo’s technology has a great market potential the firm says. In Germany alone, the assembly and disassembly of scaffolding generates annual sales of around one billion euro and over 23 Billion euro worldwide. The system uses AI algorithms, computer vision, and sensors, allowing the robot to “see” its surroundings, and then calculate the best path to take towards the workers who need scaffolding material. “We are convinced of Kewazo’s business idea and technology and therefore decided to invest in this start-up at an early stage,” says Michael Motschmann, General Partner and CEO of MIG AG. “The introduction of modern robotics into a traditional sector such as the construction industry is an extremely exciting and promising approach. “Kewazo is a pioneer in building automation, which is bringing disruption in the industry. We want to participate in this project right from the start and we believe in supporting a really strong team,” adds Dr. Klaus Feix, Venture Partner of MIG AG and responsible for the investment in Kewazo. 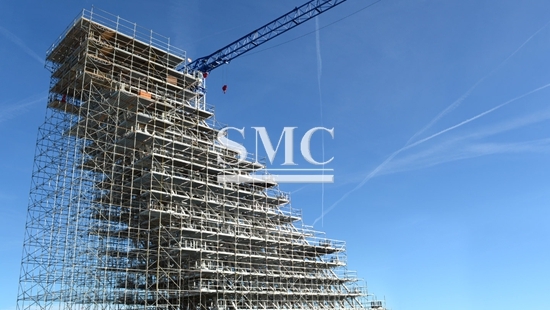 At SMC, we want to be your first choice for scaffolding material. We offer top quality cup lock scaffolding and ring lock scaffolding, with lengths full customizable. For more information including specifications and price, please click here.